March 18, 2017 represent the 4rth martyrdom anniversary of Professor Ustad Sibtay Jaffer Zaidi when he was assassinated traveling back from his job to home. Ustad Sibtay Jaffer was one of prominent scholar, Sincere Soakhwan, intellectual Professor, College Principle, social worker, and great humble man. What inspire me about Ustad Sibtay Jaffer is that his ethical manners and demeanor which represent a true Islamic ethics taught by Ahalabit (peace be upon them). Ustad Sibtay Jaffer knowledge also address through his actions which is really rare to witness. I always observe Ustad Sibtay Jaffer meet with everyone with respect, smile, kindness and politeness. Ustad Sibtay Jaffer was a person who always encourage youngster for Soakhwani. Ustad Sibtay Jaffer contributed toward revitalization of Islamic vocal fine arts of Islam/Muslims Soazkhwani. Ustad taught hundreds of students with essential utmost ethical manners toward pulpit of Ahlabit (a.s). When I joined Idera-e- Terweej –e- Soazkhwani I was communicated by my peers and elder about some essential and ethical requirements for Soakhwani. Here are few of the principles taught for new students for the respect of pulpit of Ahlabit (a.s). 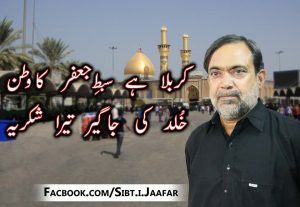 Do not expect money or demand anything for Majlish-e-Imam Hussain (a.s), never reject majlis if time and schedule permits. Respect pulpit of Ahlabit (a.s) by dressing appropriately, sit appropriately, and correct pronunciation and with respect. Always on time for majlish e Aza as per commitment. Soazkhwani should not be longer than 15 minutes with the selection of authentic and appropriate poetry with correct pronunciations. Pulpit of Ahlabit (a.s) is the place where we require utmost most moral ethics. Ustad Sibtay Jaffer taught the manners of Mimber with his actions and teachings. In every field Ustad Sibtay Jaffer prepare his students for Majlish e Aza with respect of the pulpit of Ahlabit (a.s) and best of ethics. This entry was posted in Learning and tagged Idaara Tarveej-e-Soazkhwani, Majlish-e-Imam Hussain (a.s), manqabaat, sibtay jaffer, soaz, soazkhwani, Ustad, ustad sibtay jaffer. Bookmark the permalink.